Garden Home Community Library Association is incorporated as a 501(c)3 non-profit public benefit corporation with the purpose of operating and supporting the mission of the Garden Home Community Library. The Board carries full legal responsibility for the nonprofit corporation and is the legislative body. While the library is part of the Washington County Cooperative Library System and receives funding from it, it is locally overseen by an all-volunteer non-profit organization – the Garden Home Community Library Association. The Board consists of up to 13 members – volunteers from the community who are elected by the Association to three year terms. While the day-to-day operation of the library is the responsibility of the Director and staff, the Association Board performs many important functions. The Board hires and supervises the Director, works with the Director to formulate Library policies, approves new projects, plans the annual budget, and develops long term goals and objectives. The Board also organizes and runs special library related community events, such as the semi-annual used book sale. The Director serves as the chief administrator of the library with full responsibility for personnel selection and management; development and administration of programs and services; and selection of materials. The Director is also the principal channel of communication between the library employees and the Board. Library employees have the obligation to ensure and preserve, through the public library, freedom of access to knowledge. They all share the task of public relations and of upholding the mission of the Garden Home Community Library. The mission of the Garden Home Community Library is to serve our patrons and our diverse community with professional, friendly service, quality materials, and quick access to the resources of other libraries and the world. Garden Home Community Library is located in the Garden Home Recreation Center – a facility of the Tualatin Hills Park & Recreation District. It is located at 7475 SW Oleson Road, Portland, OR 97223. The building is the site of the former Garden Home Elementary School that was closed by the Beaverton School District in 1982. The library operated as a 100% volunteer library from 1983 through 1994 when a handful of children’s books left over from Garden Home School were set up to be informally checked out. It grew over the years. 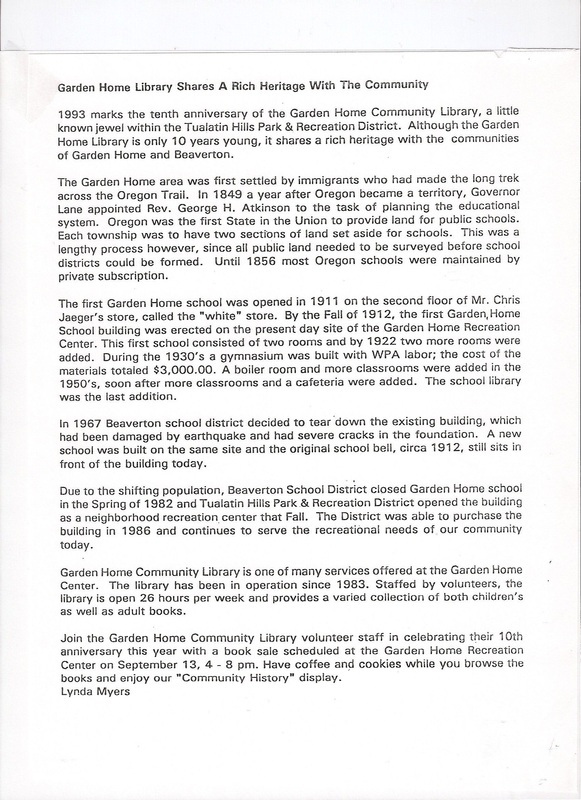 In 1994, the Garden Home Community Library Association was incorporated. That same year, the Association petitioned and received some funding from the Park District and Washington County. This enabled the Association to install a computerized circulation system and hire a part time manager. 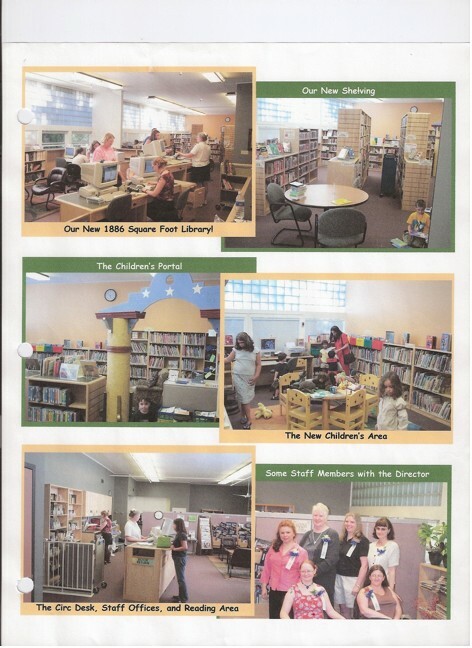 In 1996, the Association requested, and was granted, acceptance into the Washington County Cooperative Library Services system providing all the benefits of the cooperative including a stable source of funding. Since that time, usage has increased five-fold. Recognizing the need for growth, the Association completed, in April 2004, a $245,000 expansion project funded by donations from the Board, the community, and several institutional grants. The expansion doubled the size from 930 to 1886 square feet and transformed what was originally two classrooms into an expanded, dynamic, full-service library facility. Today, the library has a full time Director, a full time Youth Librarian, several part time staff members, and many volunteers. The library’s collection contains approximately 18,000 items with a yearly circulation of over 175,000 items. The library offers a wide variety of programs for both children and adults and continues to pride itself on being a warm and inviting place for the community. The facility has a close working relationship with Garden Home Recreation Center that provided the space, custodial services, and other building support as GHCL grew to be a thriving library. Today the Recreation Center and the Garden Home Community Library enjoy a mutually advantageous relationship where the programs of each are strengthened by the other. 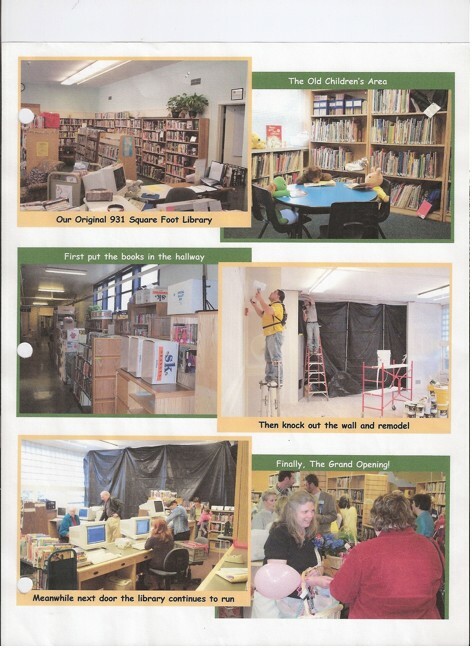 Following is a 1993 story on the 10th anniversary of the library. This is used with written permission from Linda Myers, July 6, 2010. This entry was posted in Historic Events, School and tagged Cram, Library, Rec Center. Bookmark the permalink.